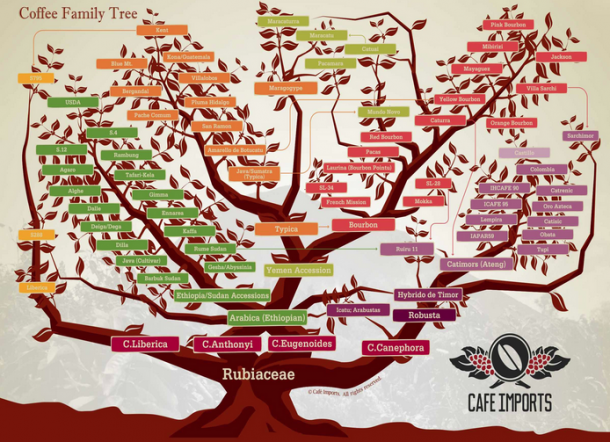 If you ever wanted to see how all the different coffee varieties are related, this coffee variety family tree by Cafe Imports is pretty great. Most specialty coffee roasters include information about the coffee variety on their labels, but it can be difficult to keep track or make sense of – next time, take a look at this and see if you start noticing patterns beyond just the origin locations you favor! They even have translated versions in Russian, Korean, and Mandarin Chinese. Click through to download an 11×17″ PDF. Wow, didn’t know that coffee had that much varieties, such a informative family tree!